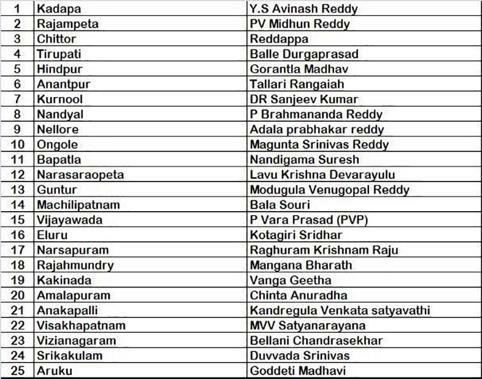 Here is the list of all 25 LS candidates from YSRCP! YSRCP announced their first list of MP candidates for 9 LS Polls. But, the party leadership has already declared that they will announce all 175 candidates at once and the names of the candidates for the other LS constituencies will be released the same day. Today (Sunday) at Idupulapaya he might release the entire list. As per now, this is the eventual list after many discussions among the party leadership here is the list of for all 25 Lok Sabha constituencies. Earlier many surveys predicted that YSRCP is going to clean sweep almost all parliament seats for sure.